Fran's House of Ayurveda: Natural sweetener, kapha-friendly! There are a variety of foods we can use as a sweetener in recipes, including syrups made from maple, rice and barley, molasses, jaggary, turbinado sugar and honey. Unfortunately, most of these are way too sugary for Kaphas or people trying to lose weight. Ayurveda recommends Kaphas use fruit juices and purees instead, though small amounts of raw, unpasteurized honey are excellent for Kaphas as well, just not for cooking. At my nearby health bulk food store a few days ago I happened upon this excellent product! 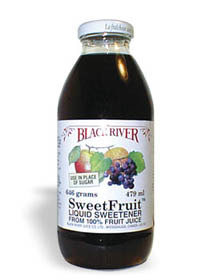 SweetFruit liquid sweetener is made by Black River, a small Canadian fruit juice making company. It's a pure fruit-derived liquid sweetener made from apples and grapes that can be used in any recipe, especially if it calls for a liquid form of sugar such as corn syrup, honey or maple syrup. For recipes calling for dry sugar, use the same amount but reduce slightly one of the liquid ingredients in the recipe to compensate. The cost is comparable to the price of honey. Alternately, you can also use undiluted frozen apple juice in recipes (cheap and easy), or make your own fruit sweetener by soaking prunes and dates in hot water and blending until pureed to the consistency of applesauce. Kaphas, there are delicious options for you out there! Don't forget, you shouldn't skip breakfast, instead make yourself a batch of muesli muffins for the week spiced with cinnamon and cardamom and sweeten with "SweetFruit", apple juice or dried fruit puree!